K4D is facilitating a learning journey on pollution and poverty. This learning journey is designed to raise awareness of the huge impact of pollution across different sectors of international development and to encourage the integration of pollution control solutions into policymaking and programming, in a multidisciplinary approach. The journey starts by raising awareness of the scale of the impact of pollution and the existence of solutions to reduce pollution by promoting the landmark report published on 20 October 2017 by The Lancet Commission on Pollution and Health. Pollution currently poses one of the greatest public health and human rights challenges, disproportionately affecting the poor and the vulnerable. Pollution is not just an environmental issue, but affects the health and well-being of entire societies. Despite the huge impacts on human health and the global economy, and the opportunity to apply simple and affordable solutions, pollution has been undercounted and insufficiently addressed in national policies and international development agendas. Prioritising and increasing investment in pollution cleanup and control presents an extraordinary opportunity to save lives and grow economies. The Lancet Commission on Pollution and Health published its landmark report on 20 October 2017. This is the first global analysis of all forms of pollution and its impact on health, economic costs, and the environmental and social injustice of pollution. The aim of the Commission is to reduce air, soil and water pollution by communicating the extraordinary health and economic costs of pollution globally, providing actionable solutions to policymakers and dispelling the myth of pollution’s inevitability. The Commission on Pollution and Health is an initiative of The Lancet, the Global Alliance on Health and Pollution (GAHP), and the Icahn School of Medicine at Mount Sinai. The Commission comprises many of the world’s most influential leaders, researchers and practitioners in the fields of pollution management, environmental health and sustainable development. The findings of The Lancet Commission on Pollution and Health will be live streamed from the first two launch events to be held at the Icahn School of Medicine at Mount Sinai, in New York City and at Maastrict University, Brussels. Please refer to the bottom of this webpage for further details. Pollution is strongly linked to poverty. Nearly 92% of pollution-related deaths occur in low- and middle-income countries. Children face the highest risks and are the most vulnerable victims of pollution because small exposures to chemicals in utero and early childhood can result in lifelong disease, disability, premature death, as well as reduced learning and earning potential. The health impact of pollution is likely to be much larger than can accurately be quantified today because of insufficient data collection and scientific research from many pollutants. Pollution is costly. Pollution-related illnesses result in direct medical costs, costs to healthcare systems and opportunity costs resulting from lost productivity and economic growth. Welfare losses due to pollution are estimated at $4.6 trillion per year, 6.2% of global economic output. The claim that pollution control stifles economic growth and that poor countries must pollute in order to grow is false. This global problem can be solved. Solutions to controlling pollution are feasible, cost-effective and replicable. Many of the pollution control strategies that have been widely used and have proven cost-effective in middle- and high-income countries are now ready to be exported and adapted for use by cities and countries at every level of income. The most effective strategies control pollution at its source. Their application in carefully planned and well-resourced campaigns can enable developing countries to avoid many of the harmful consequences of pollution and leapfrog over the worst of human and ecological disasters. Planning processes that prioritise interventions against pollution, that link pollution control to protection of public health, and that integrate pollution control into development strategies are critical first steps in fighting pollution. 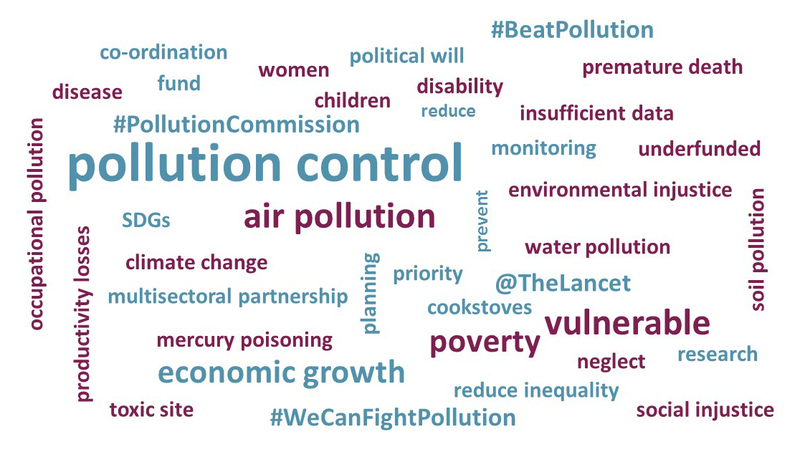 The Lancet Commission on pollution and health make six recommendations to raise global awareness of pollution, end neglect of pollution-related disease, and mobilise the resources and political influence that will be needed to effectively confront pollution. A further 12 key strategies to reduce air, soil, water and occupational pollution are highlighted in the report. Pure Earth is an organisation whose mission is to identify and clean up the poorest communities throughout the developing world where high concentrations of toxins have devastating health effects. Pure Earth devises clean-up strategies, empowers local champions and secures support from national and international partnerships. This clip shows some of the solutions to the pollution crisis in action. Partnership and coordinated efforts to control pollution are key to achieving the Sustainable Development Goals (SDGs) due to the numerous ways that pollution affects communities around the globe. For example, severe pollution causes frequent illness, disability and inability to work (SDG 1: No poverty); the impacts of pollution are sources of instability (SDG 16: Peace, justice and strong institutions); highly toxic wastewater poisons soil and food supplies (SDG 2: Zero hunger) and toxic chemicals contaminate soil, migrate into crops and into our bodies (SDG 15: Life on land). More information on achieving the SDG’s through addressing pollution can be found here. Quantify the health and economic benefits of interventions against pollution and the costs of interventions. Evidence of pollutants causing disease ranges from the well-established, to emerging effects and the unknown, where the effects of pollutants on human health are only beginning to be recognised and are not yet quantified. The Commission proposes a framework for organising scientific knowledge about pollution and its effects on human health, and to help focus pollution-related research through the concept of a pollutome. Further details of upcoming events can be found here.